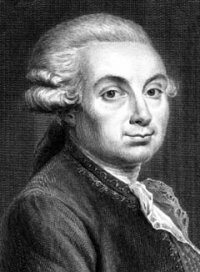 Jean Montucla was a French writer, mathematician, and scientist, who wrote several important early works on the history of mathematics. His Histoire des mathématiques (1758) was published in two volumes, the first of which covers the subject from ancient times to 1700, while the second is entirely devoted to 17th century mathematics. It is considered the first attempt at a history of mathematical ideas and problems, in contrast to earlier works that were mostly lists of names, titles, and dates. Montucla had intended to produce a third volume covering the first half of the 18th century but the amount of new developments that had appeared during this time, and the difficulties of putting recent work into its historical context, led him to abandon this aim. A few years later he published another text for which he is famed – a new, greatly expanded and improved edition of Jacques Ozanam's Récréations mathématiques et physiques (1778). Montucla's edition was particularly influential in popularizing geometric dissection problems. Charles Hutton translated it into English in 1803 and Riddle's edition was published in 1844, called Recreations in science and natural philosophy.